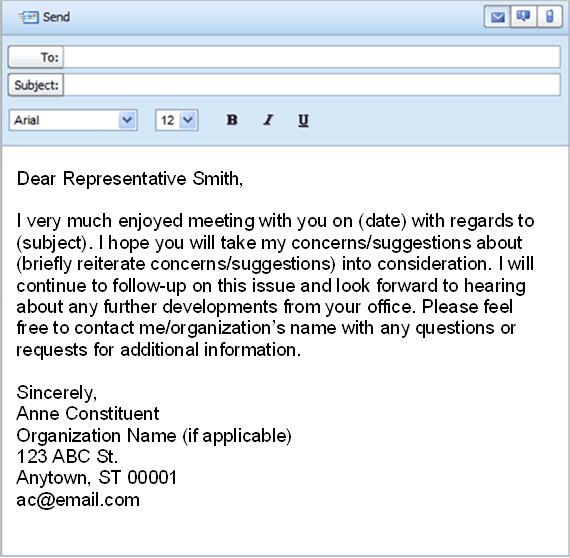 Call your elected official well in advance to schedule an appointment. Whether you are requesting a meeting in Washington, DC, your state capital or at your representative’s district office, you should always schedule your appointment weeks or months in advance. Even though you have scheduled an appointment, time conflicts may arise for your representative and you should be prepared to alter your appointment if necessary. Plan to arrive at the office building 15 minutes before the appointment to allow time to get through security. The lines can be long during busy periods. Save your visits for important issues. As a researcher or other professional, it is appropriate to ask for a meeting to briefly discuss how your knowledge is relevant to their votes. As a patient with health problems that could be affected by legislation, it is appropriate to let your elected representatives know about your experience with healthcare and how they can better represent their constituents who are patients. Whether your appointment is with the representative or a staff member, you should never assume that they are knowledgeable about your issue or any relevant legislation. Do your research ahead of time and come to the meeting as prepared as possible. You should not be there just to chat; be ready to tell them what you want, whether it is to support or oppose a bill, to try to get federal funding for certain kinds of programs or research, or to call on you for your expertise on a specific topic if the need arises. Try to be specific and offer potential solutions if you think a law or policy needs to be changed. If you are there to talk about specific bill, be sure to visit http://www.congress.gov a day or two before to see if the official is a sponsor or co-sponsor. If they support a bill that you support (or something similar), be sure to thank them, even if you want to talk about how the bill could be improved. Make it clear why you are knowledgeable about the topic, such as explaining that you are a researcher, health professional, patient, or whatever. It helps to briefly say why the issue is personally important to you. REMEMBER: they are there to represent you so don’t be apologetic or intimidated. Consider bringing brief written materials, such as an issue brief or a one-page list of concerns, which you can leave with them. You may be able to get these materials from a think tank or research center website, or you may write them yourself. Bring only the one or two pages you most want them to look at. If you are there about a medical issue, do not bring all your medical records. Dress appropriately for your meeting and show respect (whether you feel it or not). Congressional members should be addressed as “Senator” and “Representative” or “Congressman/woman.” Staff should be treated with respect even if they look young enough to be your child or grandchild. And, as with your letters and phone calls, use polite language and avoid emotional, irrational or sarcastic remarks. Always follow up a meeting with an emailed thank-you note. This will remind them of the issue and its importance to you and your community. You can also use the opportunity to again offer to be a resource to them if they have additional questions.